16 April 2016 "The Paranormal View"
Henry started pointing out my rather substantial computer problems this particular morning, plus reminding that next week Henry and Kat would be staying at the Dave Stewart farm at Gettysburg. 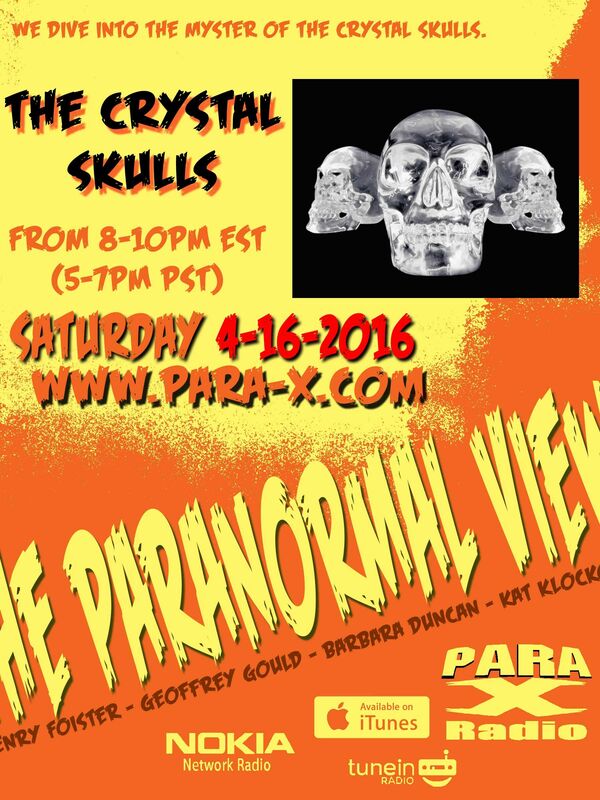 Kat checked out a lot on the Crystal Skulls topic of the night, and began discussing their origins and background. She indicated how they tend to correlate with the number 13. We discussed how they may have been made; I wondered if they might have hand polished, using as an analogy the Luray Caverns stalacmite "fried eggs" which I saw/touched when I was in Virginia during the bi-centenial week. After the first break, during which Henry hit a wrong button, causing some unexpected Dead Air, and a comical Henry sigh which Kat joked as being a Henry EVP, Ceiling Cat Barbara Duncan reported tonight our having listeners in the US, the UK, Australia, Singapore, Norway, Canada, Costa Rica, and Unknown. Henry spoke with someone with a crystal skull from Mt. Shasta at an event. Henry also brought up Anna Mitchel Hedges and the skull she claimed she found in Belize. "Off topic," we discussed recent Japan earthquakes since Kat left there, and the one in Equador that CC reported having taken place fifteen minutes earlier: during our show. Coming out of the second break, we began discussing Mt. Shasta, a dormant, "potential" volcano reputed to having UFO sightings, sacred energies, Lemurians, Sasquatch encounters, and cover up conspiracies. CC declared she hasn't, and won't, investigate there, due to its considerable tarantula population. Meanwhile Kat was grossing out the live chat room, regarding eating bugs.